Lillian Rose Woodland Baby Shower Guest Signing Canvas, Neutral, 11.75'' by Lillian Rose at Animal Backgrounds. MPN: 24BS230 GA. Hurry! Limited time offer. Offer valid only while supplies last. Lillian Rose Woodland Baby Shower Guest 11.75'' Signing Canvas. Create a special keepsake for the mommy-to-be to take home and add to the nursery. Lillian Rose Woodland Baby Shower Guest 11.75" Signing Canvas. Create a special keepsake for the mommy-to-be to take home and add to the nursery. 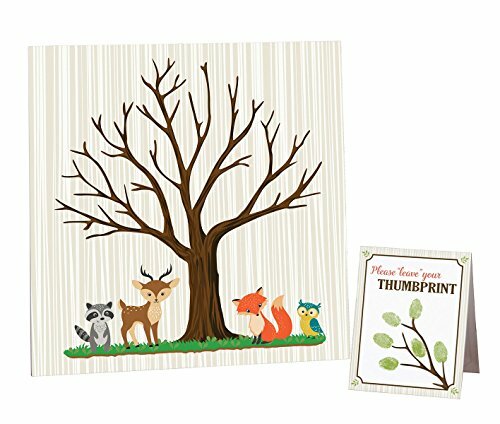 This one of a kind guest book alternative features a tree and little woodland animals, perfect for a boy or girl. Signing canvas measures 11.75" x 11.75".